Global airborne surveillance aims to provide early warning information relating to ground and marine surveillance such as border security, accidents, oil spills, land mapping and many more. Various aircrafts and other manned platforms are manufactured to provide with customizable equipment as per the mission of surveillance or they are pre-equipped for the specific missions. Airborne surveillance requires high capital investment, high maintenance and ground support to the personnel during surveillance, competitive operational, maintenance and logistics services. Thus global airborne surveillance market has high entry barriers for the new players. The national security being the prime motive of surveillance, aircrafts and drones shipment is growing at a rate of 4.1% annually. North America in order to keep checks on North Korea, it has deployed drones and surveillance aircrafts all around the North Korea Peninsula. In 2016, of the total production of aircrafts, 43.6% surveillance aircrafts were manufactured. Goldstein Research analyst forecast that the global biopolymer packaging market size is set to reach USD 6.1billion by 2024 growing at a CAGR of 4.7% over the forecast years. The technological advancement in airborne surveillance system, real time information requirement for security and other purposes to take controlled step with the help of support services, mitigating rising accidents, are some of the factors that will push the market to grow as per the forecast. 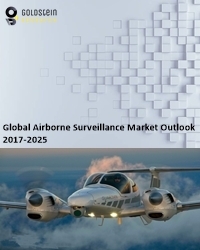 The report covers the present ground scenario and the future growth prospects of the airborne surveillance market for 2016-2024 along with the sales and revenue of the airborne surveillance equipment. We have calculated the market size and revenue share on the basis of revenue generated from major players across the globe. We have forecast the market on the basis of inventions in the area of airborne surveillances, manufacturers and suppliers of the airborne surveillance system, military and commercial application expenditure on the airborne surveillance system. On the basis of platform, manned airborne platforms segment has the largest market share of 57.3%. The benefits of using manned platform over the unmanned such as coverage of larger area under surveillance, ease of multiple operations and many more along with the high cost per unit has drove the manned airborne platform to have the largest market share. But technological development, lower cost and high performance of the unmanned platforms such as the drones, the unmanned airborne platform is growing at a fast rate of 6.8% annually and it may surpass the manned airborne platform market share over the next five to six years. Airborne surveillance market outlook 2016-2024, has been prepared based on an in-depth market analysis from industry experts. The report covers the competitive landscape and current position of major players in the airborne surveillance market. The report also includes porter’s five force model, SWOT analysis, company profiling, business strategies of market players and their business models. Global airborne surveillance market report also recognizes value chain analysis to understand the cost differentiation to provide competitive advantage to the existing and new entry players. The continuous innovation and technological advancement trend is growing the dependency on the airborne surveillance systems. For instance the AWACS (Airborne Warning and Control System) is a long range radar surveillance and control center developed for air defense by U.S. Air Force in 2017 by modifying Boeing 707 aircraft. According to the report, major driving factor for the growth of airborne surveillance market is the ease and remote monitoring features of the systems, even of the unreachable areas has increased the use of airborne surveillance all over the world. The use of AIS, MWR, LiDAR has eased analyzing the data collected which is accurate, segregated and focused. Further, the major challenge for the global airborne surveillance is overall budget problems as they are very expensive to produce and keep up because the costs may go down over time though and the human mistake in the remote controls can cause the plane to crash as they have limited abilities. Based on geography, North America has the largest market share of 34.6% in 2016 in global airborne surveillance market. North America has huge expenditure on security, being the largest manufacturer as well as buyer of the airborne surveillance system. Likewise, Asia-Pacific airborne surveillance market is growing at an annual growth rate of 4.5% on account of the rising defense budget, larger use of unmanned airborne platforms in the commercial applications, and keeping check on large marine surrounding of the major counties in Asia-Pacific. Global airborne surveillance market report comprises of the following companies as the key players in the airborne surveillance market: Saab, BAE Systems, Raytheon, Lockheed Martin, Leonardo, FLIR Systems, Northrop Grumman, L-3 Wescam, Leica Geosystems, Teledyne Technologies, Safran, Thales. What is the revenue of global airborne surveillance market in 2015-16 and what would be the expected demand over the forecasted period?